So if you've been reading for the past couple of weeks, you know that we've been playing with mathematics. Have you gathered that I love this book? We're not finished with it, of course, and probably won't be for years, and obviously I won't make any of us wait that long before telling you about it and having a give-away! Amazing Math Projects You Can Build Yourself. "From prime numbers to paraboloids, Amazing Math Projects You Can Build Yourself introduces readers ages 9 and up to the beauty and wonder of math through hands-on activities. Kids will cut apart shapes to discover area formulas, build beautiful geometric models to explore their properties, and amaze friends with the mysterious Möbius strip. Amazing Math Projects You Can Build Yourself includes projects about number patterns, lines, curves, and shapes. Each activity includes intriguing facts, vocabulary builders, and connections to other topics. 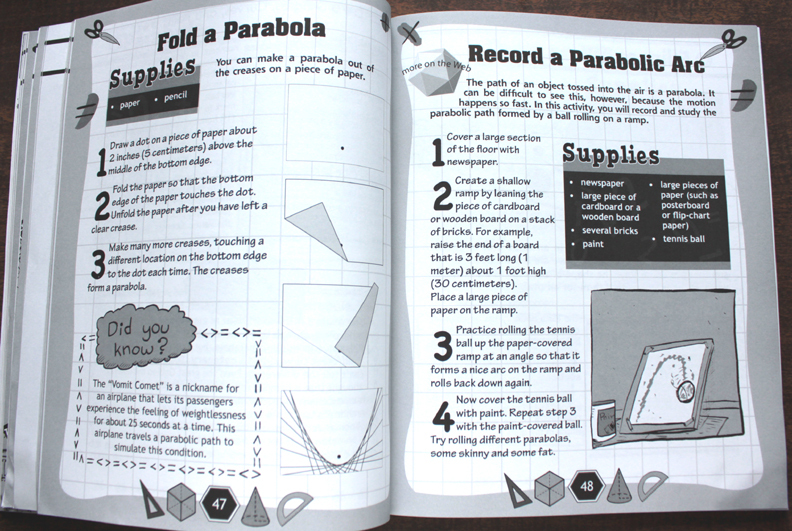 A companion website, www.amazingmathprojects.com includes video instructions for many projects in the book and provides additional activities. Who would have thought that math could be so much fun?" found patterns in square numbers (start with "one" coin... it 's a perfect square. Add "three", it's the next perfect square. Add "five", it's the next, then "seven" for the next... "nine" for the next... aaaah. Next is a project for multiplying fractions... I can't wait! :) Really. Coming up are making a fraction addition dial, learning the Fibonacci Sequence, making a square magically appear using Fibonacci numbers, finding spirals in a sunflower, Golden Ratio, finding the Golden Ratio around you, drawing a golden spiral, and three more large sections consisting of Angles, Curves and Paths, Shapes, and Patterns... (up until the mention of Angles, Curves and Paths, all of these things have been and are in the first section, Numbers and Counting). I mean, we all have different styles and perceptions, and I am definitely not a mathematician, so you have to take that into account, I guess. But I love, love, love this book. It's interesting and challenging... easy to understand, and fascinating. We've investigated the binary numeral system (on our own), gotten out our one-inch cubes, dumped out coins, played with the calculator, and had our cuisenaire rods all over tables while we've read and investigated. Our experience has been rich and full with this book. Now... on to the give-away. First know that I love this book well enough that I shall purchase one (or possibly two) myself to give away here, but this particular give-away is sponsored by Nomad Press, and they have something different (but very cool) for you. It's their Discover Series... a set of four books! third entry for a facebook mention or tweet. You don't need to leave more than one comment, I do the drawing by hand, so you can just give the the particulars in your comment. We'll have the drawing open until next Thursday afternoon, November 17th. Open to U.S. shipping addresses. And coming right after that, we'll have a give-away for something beautiful from Heart Rockin Jewelry! You won't want to miss that! That looks like a really cool book. I think JBug would like it very much. Math is the one area where (unfortunately) I most often fail at being creative. So, please enter me in the giveaway. I could use some ideas! Sounds like just the type of book i would love to explore with my kids. The other four books look good too. The Amazon one would be perfect for my rain forest lover. First of all don't put me in your drawing. I just wanted to say that math book look like so much fun, we've been on a math kick here. Must explore it soon. Thanks once again for finding awesome books n' stuff. I'm already a follower, which is why I'd already been coveting the math book. Looks great! I'm sure the other four will equally enjoyable in their own ways, so I'll share the link on fb as well. Thanks! 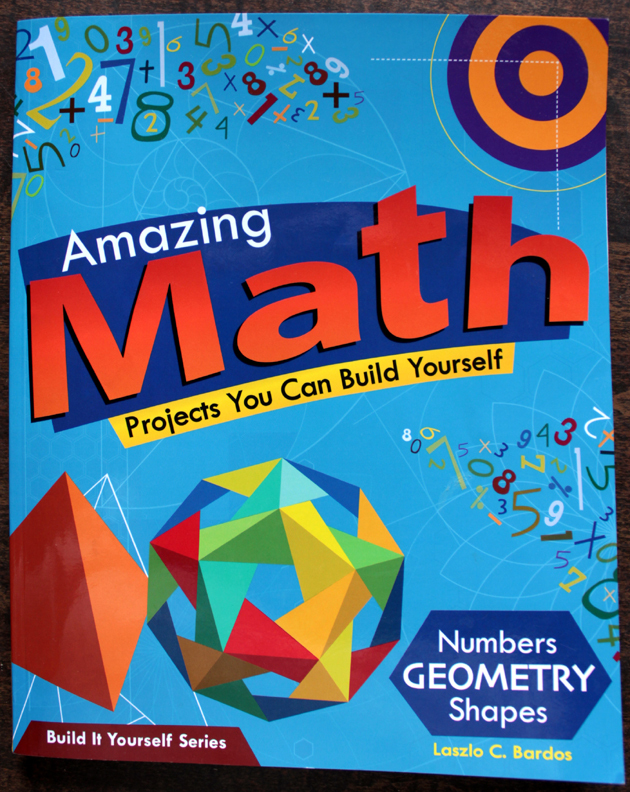 after reading your blog post about "amazing math" we got the book from our library and you're absolutely right: it is fantastic!! we also checked out a book about inventions by leonardo davinci, which is equally great. Daniela - I'm glad you like it, too! This is an amazing giveaway! Those books look really interesting. I love your site, love the freedom and natural learning. Our two little ones are at home (5 and 3) and I absolutely love the seeing them explore and learn just by being kids. Thanks for the chance to win! Also, I'm already a follower. In my search to find our grove, and feeling pushed and pulled by the "right thing to do" I've found a lot of comfort in the excitement of learning in your blog. That's what I desire most for our girls. I wish I could find you on Twitter... are you on twitter? Regardless, I follow you on FB, passed along the giveaway via FB and Twitter, and (of course! )I read the blog every chance I get. 1.) Comment: Ooooohhhh, me likey! And, of COURSE we follow you! Ooo! What a fabulous giveaway! I'm here via Debbie's facebook post and have added you to my google reader! I guess my comment didn't go through. Am I too late to enter?